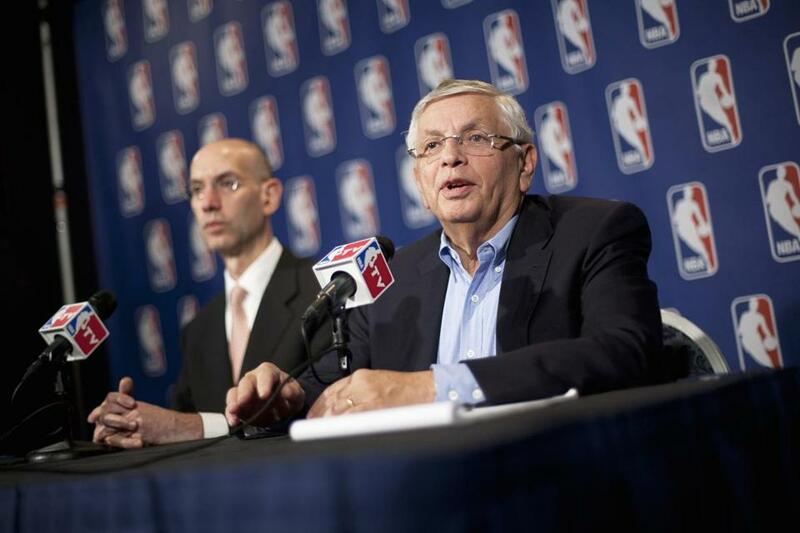 NBA commissioner David Stern (right) spoke to reporters after taking part in contract negotiations. The NBA lockout has passed the four-month mark, and this is the stretch the owners have been waiting for, when the pay period begins and they can begin denying players paychecks. The owners have widely believed that the players will become increasingly desperate for a settlement when they begin feeling the financial brunt of the lockout. While some players get paid year-round, a good portion of salaries begin on Nov. 15. There are temporary salves to aid financially depleted players during the short term. The union has built a fund over the past few years for just that reason. Also, because the players’ salaries did not equal the agreed-upon 57 percent of basketball-related income last season, the owners owed the Players Association an estimated $162 million - or the 8 percent of salaries that were being held in escrow. So the NBA issued those checks, then added $26 million to equal the 57 percent. NBPA executive director Billy Hunter said last week that checks were being handed to players for $100,000 to help with expenses during the lockout. While the NBPA anticipated this lockout as early as three years ago and warned its constituents about conserving money, there is speculation that some players may not survive financially if an entire season is missed. The perception that most NBA players blow their earnings on jewelry, cars, and women is inaccurate, but some do have trouble figuring out proper investments, according to an accountant who has dealt with professional athletes. Of course, there are revenue streams for standout players that may not be available to their lesser-known counterparts. Kevin Garnett and Kobe Bryant still receive endorsement money from shoe contracts and other products. Rajon Rondo has been making marketing appearances all summer for Red Bull, Ray Allen is a pitchman for Vitamin Water. As for rookies who have yet to receive any NBA paychecks, some are living off endorsements, trading-card money, or even loans from agents. Others have sought overseas opportunities or decided to go back to school. Former Knicks guard Andy Rautins, who played sparingly last year as a rookie, has moved back in with his parents. Brandon Jennings, who has an endorsement deal with Under Armour clothing, took a job in the company’s Baltimore offices, helping design sneakers. Raiola said one former client was so astute financially that he understood team fines for being tardy for practice were tax-deductible, but tickets for speeding to make it on time weren’t. The NBPA relief fund was established well in advance of the lockout, but it is uncertain how much money is in the war chest and whether players on the lower end of the NBA pay scale would receive first opportunity for aid. But if the lockout continues, the players’ resolve will be tested, and the owners are banking that the more money they are denied, the more they will relent. “You have sympathy for anybody in this situation losing money,’’ said Allen. “There’s so many people attached to the game losing money, and I have sympathy for everybody. When former NBA coach Larry Brown addressed area high school coaches at the Harvard Coaches Clinic last week at Lavietes Pavilion, he related story after story about former pupil Allen Iverson, who was his most challenging project during their years in Philadelphia. It has been nearly a year since Brown stepped down as Bobcats coach in a mutual decision with owner Michael Jordan. But he hardly viewed the break as a retirement. He has spent several months visiting college coaches and teams, giving motivational speeches, and hanging out with junior members of his coaching tree. “I coach the pros just like college kids,’’ said Brown. “Everybody says the pros don’t want to learn, and that’s not true. They all want to learn and they all want to get better. Given his passion to teach, his sharp mind, and the respect he has among his peers, there is no doubt Brown wants to return to coaching. And he even discussed the defensive coordinator position with Celtics coach Doc Rivers, who once played for Brown with the Clippers. Rivers told Brown that he wanted to promote assistant coach Mike Longabardi, who has never served in such a significant capacity. “I thought a lot about it,’’ Brown said of the vacant job. “Doc offered me the job once and he called me at the end of this season. He interviewed for the Minnesota coaching position in June before losing out to Rick Adelman. Brown’s last two stops - with the Knicks and Bobcats - did not end well. He was essentially fired from both clubs. If Brown had his choice, he would get another opportunity in a decision-making role. His fear with taking the Jerry West route of being a consultant is that he would want to return to coaching or a more prominent front-office role. After he left the Knicks in 2006, Brown briefly served as president of the 76ers but soon left after Ed Stefanski was named general manager. “I was thrilled, but all of a sudden they bring in Stefanski and they want me to keep my title and he didn’t want me around,’’ Brown said. “That was real uncomfortable. This stretch is reminiscent of 13 years ago when NBA coaches were scrambling to keep busy, left out of labor negotiations and unable to contact players. Brown said he used the last lockout to attend a series of college practices at Princeton, Kansas, North Carolina, and Cal. He had the time to watch O’Connor’s daughter Katie play basketball at Virginia Tech. O’Connor is currently the Jazz GM. But the lockout also reminds Brown that the league is becoming stagnant, unable to capitalize on perhaps the best period since the Jordan era. “I hate what’s happening,’’ he said. “We had just a great year last year. The playoffs were so compelling. We had so many great young kids. One of the few bright spots of the lockout for the Celtics is the development of second-round pick E’Twaun Moore, who is three regular-season games into his stint with Benetton Treviso in Italy. Moore has played in all three games for Benetton and is averaging 6.7 points and 3.3 rebounds per game. He is shooting 50 percent from the field on a team that includes Brookline native Jeff Adrien and ex-Celtic Brian Scalabrine. Moore signed a one-year contract with an out clause, and has the option of spending the entire season there and returning to sign with Boston after the season. “Certainly he wants to be in the NBA,’’ said his agent, Mark Bartelstein. “It’s his dream for as long as he can remember, but he can only control certain things. “That being said, he’s focused on taking advantage of everything that’s been in front of him now. It’s a great opportunity. He’s playing for a terrific team, a great organization. Moore’s Purdue teammate, JaJuan Johnson, whom the Celtics expect to be a rotation player, has passed on international opportunities and continues to work out in Indianapolis. Meanwhile, second-year Celtics guard Avery Bradley’s stint in Israel lasted two games, as he has decided to return to the United States. He leaves Hapoel Jerusalem as another NBA player who found a trek overseas to be not so easy. DaJuan Summers also prematurely ended his. There is good reason why Celtics co-owner Wyc Grousbeck has said little during this NBA lockout, as commissioner David Stern levied a $500,000 fine against Miami owner Mickey Arison for a tweet following the breakup of talks last week in New York. When a Twitter follower accused the players and owners of being greedy, Arison responded, “You are barking at the wrong owner.’’ Such a tweet implies that Arison is one of the larger-market owners who want to facilitate a deal but are outnumbered by smaller-market owners willing to risk a season and sweeten their chances at making a profit. Arison has attended a majority of recent labor meetings and has gained attention with his consistent tweeting after negotiations. Not only has Grousbeck remained mum for weeks, but members of the Celtics organization are not allowed to discuss any aspects of the lockout, not even what they will do in the meantime. Doc Rivers and Kevin Garnett were two of the former Illinois high school standouts inducted into the state’s basketball hall of fame. But because of the lockout, the Celtics coach and power forward are banned from extensive contact and have to report any interaction to the NBA. On several occasions, NBA coaches and players have crossed paths, but the coaches are banned by the league from even speaking to them. In one instance at a Las Vegas casino, Nets guard Deron Williams saw his coach, Avery Johnson, and yelled for his attention. Johnson, who desperately wanted to talk to Williams about his decision to play in Turkey, resisted and waved him off. There has been no announcement about a rescheduling of the six-game World All-Star Classic that was supposed to begin last Sunday in Puerto Rico. The opener was canceled two days before it was set to occur because players such as Garnett and Paul Pierce were apprehensive about the tour and were uncertain about a barnstorming voyage when owners and players appeared closer to a deal . . . Some interesting names were in the news again during the NBDL draft Thursday. The first overall pick was guard Jamaal Tinsley, who hasn’t played in the NBA since 2010 with the Grizzlies. NBA players who did not play in the league last season were eligible for the draft. And that includes former Celtic Gabe Pruitt, who was taken fourth overall by the Sioux Falls SkyForce. Pruitt spent last season playing for Ironi Ashkelon in Israel, but his career has never been the same since his DUI arrest two years ago after a Celtics game. Pruitt has played with two NBDL teams - the Los Angeles D-Fenders and Utah Flash. NBA retreads Alando Tucker and Jamal Sampson also were first-round picks. Gary Washburn can be reached at gwashburn@globe.com. Material from interviews, wire services, other beat writers, and league and team sources was used in this report.